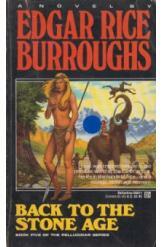 Back to the Stone Age Edgar Rice Burroughs Sci Fi. Book is in good condition, all pages intact. Lieutenant Van Horst has been stranded in the prehistoric world of the Hollow Earth. Hounded by harsh climate, deadly reptiles, and savage tribesmen, he rides his mammoth Old White toward the peaceful cave-dwellers of Lo-har. Book 5 of the Pellucidar series.